You'll be ready to battle it out in the Star Wars universe as the galaxy's best bounty hunter in this collector's Boba Fett helmet! The licensed helmet is green with a worn look. It is made from a hard plastic and features a black, see-through visor. An antenna is attached on the side and is adjustable. 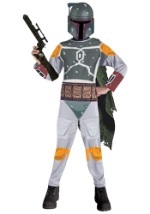 Enhance your Star Wars experience when you add any of our Boba Fett costumes!